Now for some notes from the near geriatric ward of heavy metal: Tony Iommi (61), Geezer Butler (59), youngster Vinnie Appice (49), and near septuagenarian Ronnie James Dio (66) have released their highly anticipated Heaven And Hell collaboration, 'The Devil You Know.' It seems the Heaven And Hell formation and tour in celebration of 'Black Sabbath: The Dio Years' was not aa one off as we thought. As far as I'm concerned 'Heaven And Hell' and 'Mob Rules' were two of the best post-the-other-guy Black Sabbath albums as Dio arrived to resuscitate a nearly lifeless and rancid band. But, by gosh, that's nearly 30 years ago, and Dio was barely out of his metal diapers at 36. 'The Devil You Know' finds the band, especially Dio, in top form. Actually, Dio is flawless: passionate and articulate in his delivery. The general feel of the album is definitely on the heavier side of classic heavy metal. Imagine 'Paranoid' meets 'Dehumanizer' but leans more towards doom metal, and you may have an apt description. Actually, when Heaven And Hell traveled down this slower, more plodding, road my interest waned significantly. 'Rock And Roll Angel,' 'Follow The Tears,' and the desperately tedious 'Breaking Into Heaven' may be the musical equivalent of a Quaalude. Only the players and particularly Iommi's fret work save these songs. Thankfully, this is not the whole of the album. The best stuff comes at the beginning from 'Atom & Evil' through 'Double The Pain' with 'Fear' and 'Bible Black' being truly inspired pieces of classic heavy metal. Later on 'The Turn Of The Screw' and 'Eating The Cannibals,' Heaven And Hell become more upbeat delivering two lively and solid rockers. Despite trending more towards the heavier and sluggish side of doom metal, Heaven And Hell's 'The Devil You Know' is a good collaborative effort for the Dio-era Black Sabbath. The true stars here are the players, with Ronnie James Dio shining the brightest, and not necessarily the songs which vary between inspired metal genius and simple tedium. 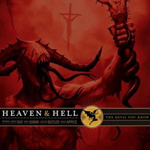 Despite trending more towards the heavier and sluggish side of doom metal, Heaven And Hell's 'The Devil You Know' is good collaborative effort for the Dio-era Black Sabbath. The true stars here are the players, with Ronnie James Dio shining the brightest, and not necessarily the songs which vary between inspired metal genius and simple tedium.